Our 2002 Russian River Valley Pinot Noir sees the debut of two new vineyards that will feature prominently in our future Pinot efforts. 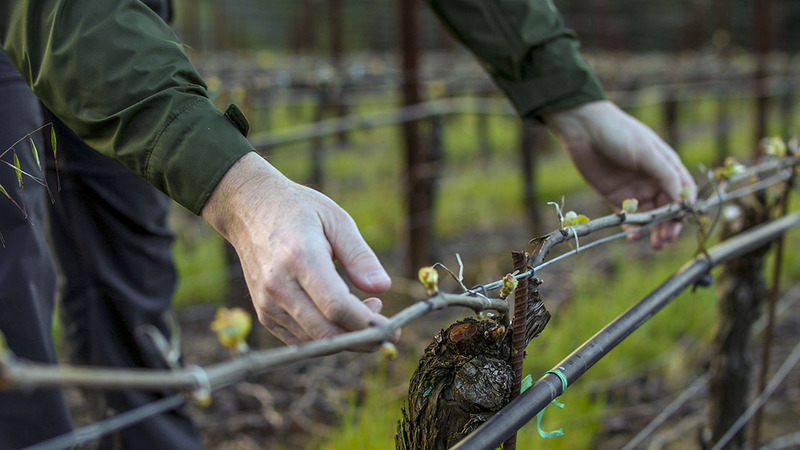 Planted within half a mile of each other, the Wildrose and Sundawg Ridge Vineyards lie in the heart of the Green Valley sub-appellation, which has become DuMol Pinot HQ. Planted to a mix of new Dijon clones & older Californian selections, these two new sources provide dark powerful fruit, fine tannins and striking acidity. They nicely complement our more established mature Dutton Ranch sources, which currently show greater textural development and Pinot earthiness due to their respective vine ages. This blend continues our shift in focus toward the Green Valley district, west of Highway 116 between the towns of Sebastopol and Occidental. Here we find greater coastal influence, which tempers the summertime highs giving us the darker fruit profiles we seek, in addition to brighter acidity and bolder tannin structure. 2002 was a dream growing season for Green Valley Pinot Noir. Crop levels and berry size were naturally moderate and stems achieved true lignification. A cooler than typical July/August created an extended veraison period which necessitated precise green thinning to ensure uniform maturity at harvest. Our European-style season was abruptly interrupted by late summer heat in mid September, which reduced berry size and added some Californian richness to our more structured fruit. The natural fruit concentration was immediately apparent in the field at harvest. Most lots were fermented with 10% whole clusters providing aromatic & structural complexity. In the cellar, fruit of such concentration required only moderate extraction, thus our vinifications proceeded slowly and patiently at cool temperatures. In barrel the wines were immediately superb. Malolactics proceeded steadily, finishing in May and the blend was made at a single racking in July. The final wine represents a blend of 12 individual fermentations, covering 14 distinct clonal/vineyard variations and co-fermentations. Now thats diversity! A deep ruby color leads to a strikingly aromatic nose of black cherry, plum and our trademark "floral-Pinot-spice". The palate entry is succulent yet vibrant with bright currant, black raspberry and darker kirsch flavors. The mid-palate is expansive and dense but not ponderous due to the inherent brightness of the wine. Tannins and acids are nicely integrated on the lengthy, persistent finish. As with all our Russian River Pinots, we find that the secondary nuances of earth, truffle and game develop with a year or two in bottle. Our 2002 blend can be enjoyed on release for its explosively aromatic fruit and sweet texture, but will improve in a cool cellar for 4 to 6 years. Decant for an hour during its first 3 years to allow the wine's complexity to shine.